Every single day I read about new films being released whether it is a week from now or projects just getting underway, still years from hitting the cinemas, so very rarely am I surprised to learn about a film after it has already been screened by critics. A few months ago I turned on WGN morning news in Chicago, as I do every single day before work, and on Friday mornings the film critic for the network was doing his usually weekly reviews segment. Typically at this time I am half listening, half still asleep, but I vividly recall his review of a new film titled The Guest for two reasons: I had never heard of the picture prior to that moment, and he declared it to be the "worst movie of the year". This caught my attention because rarely is this man hyperbolic about new releases. In fact, he is frustratingly bland and confusing when it comes to awarding overall scores, as he will discuss the brilliance of one picture and award it a B, and then move on to something that didn't work at all for him and announce it's grade as a C+. Worst of the year? This is an especially bold statement coming from a man whose career is literally watching every film released throughout the year. I watch a lot and have seen a lot of truly awful films, yet I still have so many I skipped because I couldn't muster up the energy to force myself to sit through them. The ironic thing about naming something the worst is, it makes me want to see it that much more. I had to understand what made him hate the film on that lowly level. Now, I try not to question an opinion because it is just that, an opinion. I know my personal worst film of the year, A Million Ways to Die in the West, is one others have enjoyed and while in my own mind this thought is baffling, to each their own. However, after seeing The Guest, the word "worst" never even came close to my thought process at any point. In fact, the film is a downright blast, reminiscent to the type of genre movie that would have had me watching it on repeat when I was younger. Directed by Adam Wingard, who also was behind the camera for the horror film You're Next last year which I am still yet to see, The Guest focuses on the Peterson family as they are grieving the loss of their son Caleb who died fighting in Afghanistan and an unexpected visitor that arrives at their door one day, a man named David Collins who claims to have been very close with Caleb while overseas and points out a picture inside the Peterson home of them together to prove it. David is handsome, warm, polite and seemingly the perfect house guest, even stepping in to help out the family in any way he can, but of course, David has a dark secret and not everything is as it seems. Dan Stevens plays the hell out of David, and his charms not only work on the characters on the screen, they are infectious as a viewer as well. Even when he is at his worst and his true motivations start to become obvious, you can't help but view him as strangely likable despite the scary evil that hides behind that smile. The rest of the cast is fine, with pretty mediocre performances coming from those that played members of the Peterson family, but it doesn't matter because Stevens steals every scene he is in and my attention was constantly drawn to him in every frame. The aesthetics of the film are wonderfully realized, utilizing the rural feeling of the american south while also giving the general tone of the film a vibe like it was filmed in the 1980's, which is only enhanced further by the truly inspired and fantastic soundtrack that pops up throughout. 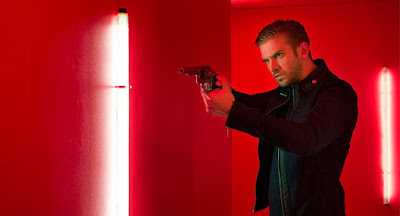 I know others have said that The Guest felt like a combination of Refn's Drive and a classic 80's horror film, and I think this really is the perfect way of describing it. Worst film of the year? Balderdash. The Guest is a glistening, bloody delight, and the final fifteen or so minutes alone are worthy of enough admiration to elevate this work beyond a bottom of the barrel list. A brilliantly used Halloween high school dance set piece, the effects of a fog machine and the finest usage of the musical score all work together harmoniously and were enough for me to raise my own opinion of the work from being something very good to a film I truly loved. I keep replaying that entire sequence in my head, and it puts a smile on my face every time. Seriously, it's that good. As for THE GUEST - I actually remember seeing the trailer a while back - will definitely bump it up my list now. Thanks for bringing to my attention!! I wasn't too happy with Michael Bay's version of the Transformers. But I was able to tolerate the first two since they did provide fun while it lasted. The third one in my opinion was the worst of the whole franchise as it was completely out of control and murder to my senses. Talk about overkill. I never really expected to like Transformers 4. But I found myself enjoying it again while it lasted. It was a rehash of the earlier parts and again too much focus on the humans. But it was moderate and tolerable. Especially compared to it's predecessor. No problem, absolutely check it out. I think the local critic who declared it the worst was missing the point of it all, that the cheesy, over-the-top tone was intentional and totally fit the vibe of the whole experience. The problem with reviews is and always will be that it is very subjective. Of course one can find that someone is lacking in taste if he thinks a movie is good that he or she found real bad but that also is very subjective. However I do think that there are many reviewers out there who jump on the band wagon without daring to go against the general consensus. I think as long as someone explains himself why he thinks this, it's ok with me. Oh yeah, and I am a huge supporter of the concept of to each their own. I don't like to crap on anyone typically for their opinion, and if he honestly believes that The Guest is the worst film of 2014 than so be it, but I don't see half of the amount of films this guy does and I have seen sooo many bad films, haha. I can't imagine watching, say, The Legend of Hercules and thinking it was better than this. I would actually like to go back and find out what the critic in question said again in detail regarding this film, because I simply remember the strength of those specific words and not his reasons why.